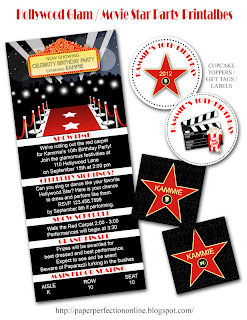 I just finished making a Hollywood Glam / Movie Star / Red Carpet / Celebrity invitation and cupcake toppers for a client that I work frequently with for her family birthday parties and special events like graduations. I love designing new party printables for clients and sharing them with you! The square black star cupcake topper images were designed based on the "Hollywood Walk of Fame Stars". If you would like these party printables and other matching items like cupcake wrappers, bag toppers, candy bar wrappers, birthday banner and so much more contact Paper Perfection at jtanddolly@yahoo.com for pricing and details.